In the Land of Oz there are some creatures that fly through the night causing mischief. These feared critters work for the Wicked Witch of the West and they are not to be messed with. So when you're walking through the forests of Oz and you hear something flying toward you, run as fast as you can because it means a flying monkey on your trail. I don’t know about you, but the flying monkey scenes from the original film were by far the most terrifying thing I saw as a kid. The monkeys were scary in ways I couldn’t explain. Maybe it was their somewhat human faces or their oddly colored skin, but no matter the reason, they were the source of many nightmares and sleepless nights when I was a child. Today’s kids are a bit tougher though, and rather than be scared by them, they want to be them! 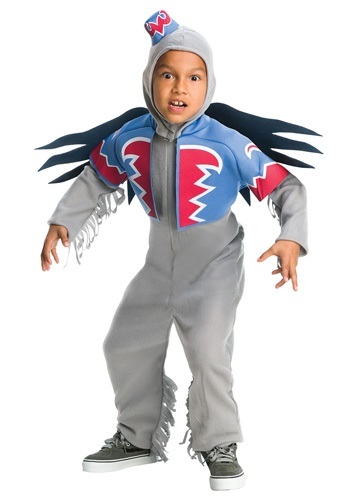 This child flying monkey costume is perfect for Halloween or a Wizard of Oz party. It comes with everything they need to terrify the adults they meet along their trick-or-treat route! The officially licensed Wizard of Oz costume comes with a jumpsuit that fastens with Velcro in the back for a comfortable fit. The foam vest panels and wings are sewn to the front and shoulders (respectively) of the jumpsuit so you don’t have to worry about them losing the pieces! The hood has an attached foam hat in the classic flying monkey style and it secures with Velcro under the chin. Team up with the Wicked Witch of the West for a great group costume!